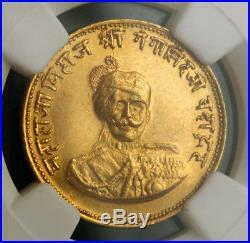 India Sikh Empire Maharaja Dulip Singh AV Emergency Rupee VS1905 Multan Herrli 11.09.04 MS66. Top of the Population. Bold Leaf, Clear inscription & Date rarely found on these issues. 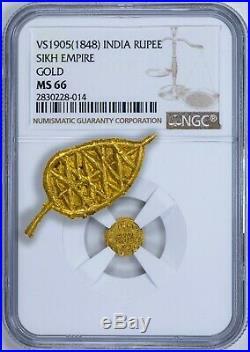 No other Sikh Coin has got a higher grade than a 65. Complete Date 1905 and Complete Legend Sahai SatguruMay the true Teacher help! 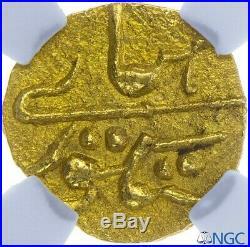 This coin was struck during the siege of Multan by the British in VS 1905 (1848 CE). The garrison was led by Diwan Mulraj, who found himself in possession of no silver but did have a considerable store of gold. Consequently, he struck these small gold pieces to pay his troops. They were meant to pass as one rupee coins. The coins were struck with either plain or reeded edges; this one has a plain edge. The legends on the coin reflect the dire circumstances in which it was struck. 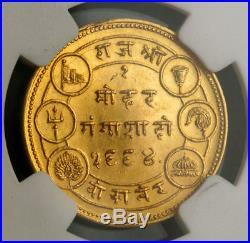 On the obverse Sahai Satguru, there is an appeal to the Guru to help, and on the reverse is the word mundarka, probably related to the word mundra, which means ring or collar. During the siege, the city was surrounded by British troops, who eventually broke through and occupied Multan. The East India Company’s Bengal Army under General Whish began the siege of Multan. But it was too small to encircle the city, Currie decided to reinforce them with a substantial detachment of the Khalsa under Sher Singh Attariwalla. Sher Singh’s father, Chattar Singh Attariwalla, was openly preparing to revolt in Hazara to the north of the Punjab. On 14 September, Sher Singh also rebelled against the East India Company and joined the revolt. However, Dewan Mulraj and Sher Singh could not agree to combine their forces and fought separately against the British. On 27 December, Whish ordered four columns of troops to attack the suburbs of the city. Mulraj’s forces were driven back into the city, and Whish’s force set up batteries 500 yards from the city walls causing great damage in the city. On 30 December, the main magazine in the citadel exploded, killing 800 of the defenders. Mulraj nevertheless maintained his fire and sent a defiant message to Whish, stating that he still had enough powder to last a year. He attempted to mount a sortie against the besiegers on 31 December but this was driven back. Whish ordered a general assault on 2 January 1849. The attackers successfully scaled the breaches, and the battle became a bloody house-to-house fight in the city, in which many defenders and civilians were killed indiscriminately. Mulraj offered to surrender if his life was spared, but Whish insisted on unconditional surrender, and on 22 January, Mulraj gave himself up, with 550 men. The British gained vast quantities of loot. Mulraj’s treasury was worth three million pounds, a huge sum for the time. There was also much looting in the town, by both British and Indian soldiers. With the fall of Multan, Whish’s army was able to reinforce the main Bengal Army force under Sir Hugh Gough. Whish’s heavy guns were decisive at the Battle of Gujarat, which effectively broke Sher Singh’s and Chattar Singh’s armies and ended the Second Anglo-Sikh War. A SUPERB example of a VERY RARE type of great historical interest. All item(s) I sell are guaranteed to be Authentic. I follow the American Numismatic Association (ANA) Dealers Code of Ethics. Pictures: All pictures are taken under natural light and are not retouched. The item(s) you see in the picture is what you’ll get. References: For World Coins, we use Krause Mishler Numberse(KM), for others such as Islamic Coins Steve Album’s Checklist References are provided. I expect for you to do the same when you get the item. If you are not satisfied with your item and/or service. Please inform me immediately. If you have a problem with the item or the service, all you have to do is inform me and I will do everything to resolve the problem. With prior approval, please make sure that the return is trackable so both parties know where the item is. 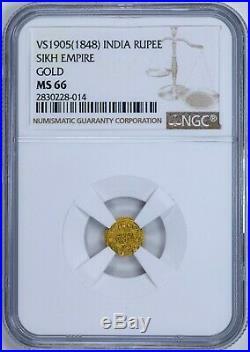 The item “India Sikh Empire Diwan Mulraj Gold Emergency Rupee Multan VS1905 KM87 NGC MS66″ is in sale since Wednesday, March 20, 2019. 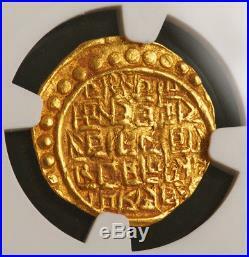 This item is in the category “Coins & Paper Money\Coins\ World\Asia\India\Independent Kingdoms”. The seller is “shredplayer” and is located in Lee’s Summit, Missouri. This item can be shipped worldwide. 1181, India, Kadambas of Goa, Sivachitta. 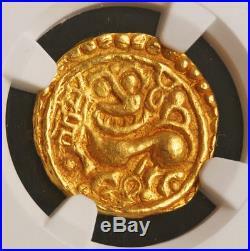 Gold “Lion” Pagoda / Gadayana / Stater Coin. 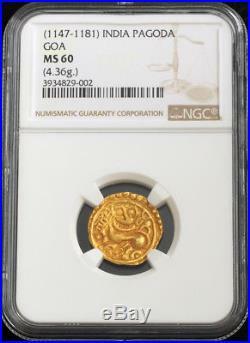 Certified and graded by NGC as MS-60! Reference: Friedberg 307, Mitchiner 654. Denomination: Gold “Lion” Pagoda. Actually heavier than a pagoda, often referred a Gold Gadyana, described in Mtchiner as Gold Stater! Diameter: 19mm Weight: 4.39gm Material: Gold! Obverse: Roaring lion standing left, looking right. Cyclial date (Visu) in Devangari in left field. All within beaded border. Reverse: Devangari legend in five lines. Ll within beaded border. “Shri Saptakoti/ sha Labdhavara Ahri shi/ Vachitta Tribhu / vana malla Deva Ma/ lavara Mari”. The Kadambas of Goa were a dynasty during the Late Classical period on the Indian subcontinent, who ruled Goa from the 10th to the 14th century CE. They took over the territories of the Silaharas and ruled them at first from Chandor, later making Gopakapattana their capital. Inscription found in Shimoga in Karnataka, the Kadambas are of Brahmin origin, descended from Mayurasharma. As a feudatory of the Chalukyas, Kadamba Shasthadeva was appointed as the. Of Goa by the Chalukya king, Tailapa II. According to the Savai vere inscription, the Kadambas were allies of the Chalukyas, whom they helped to defeat the Rashtrakutas. Shashthadeva later conquered the city of Chandrapur from the Shilaharas and established the Goan Kadamba dynasty in 960 CE. King Shashthadeva conquered Goa, Port Gopakapattana and Kapardikadvipa and annexed a large part of South Konkan to his kingdom, making Gopakpattana his subsidiary capital. The next King, Jayakeshi I, further expanded the Goan kingdom. A Jain Sanskrit text. Mentions the extension of his capital and that Port Gopakapattna had trade contacts with Zanzibar, Bengal, Gujarat and Sri Lanka. Gopakapattana was a pleasant commercial city, well connected with Old Goa and a trading hub for over 300 years. In the 1320s it was looted by Khalji general Malik Kafur. During the rule of the Kadambas, the name and fame of. Goa’s religion, culture, trade and arts flourished and the dynasty built many. They assumed titles like. They married the royalty of Saurashtra and even local chieftains. The kings patronized the Vedic religion and performed major fire sacrifices. Such as the horse sacrifice. They popularized Shaivism and patronized Jainism in Goa. The languages of Kadamba administration were Sanskrit and Kannada. They introduced the Kannada language to Goa, where it exercised a profound influence on the local language. The Nagari, Kadamba, Halekannada and Goykanadi scripts were very popular. It is known from another inscription that Tribhuvanamalla established a. Brahmapuris were ancient universities run by Brahmins, where Vedas, astrology, philosophy, medicine, and other subjects were taught. They were found in Goa, Savoi verem, Gauli moula, and elsewhere. Kadambas ruled Goa for more than 400 years. On 16th October 1345 Goa Kadamba King Suriya Deva was assassinated by Muslim invaders. The item “1181, India, Kadambas of Goa, Sivachitta. 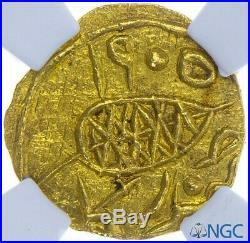 Gold Lion Pagoda Coin. NGC MS-60″ is in sale since Thursday, June 28, 2018. 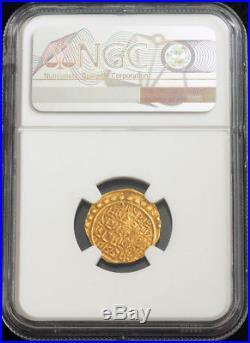 This item is in the category “Coins & Paper Money\Coins\ World\Asia\India\Independent Kingdoms”. The seller is “coinworldtv” and is located in Europe. This item can be shipped worldwide. 1937, India, Bikanir State, Ganga Singhji. 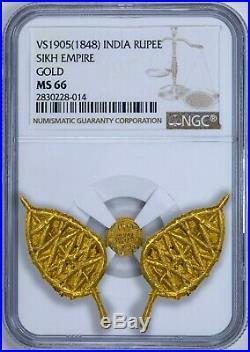 Gold Nazarana Mohur Coin. Mint Date: 1937 (VS1944). 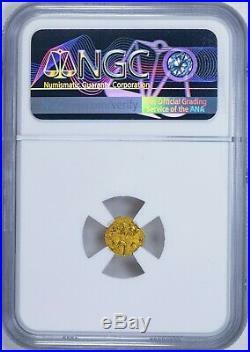 Certified and graded by NGC as MS-62! Reference: Friedberg 1055, KM-XM3 (previously KM-75). Denomination: Nazarana Mohur (Mohur for offering/presentation). 50th Anniversary of Reign of Ganga Singh as Maharaja of Bikanir. 8.5gm Diameter: 28mm. Obverse: Uniformed Bust of Maharaja, wearing jewelled turban and military orders facing. Reverse: Nagari Inscription in three lines within decorative border with six symbols in medallions and seven characters. His Highness General Maharaja Sir Ganga Singh (October 3, 1880, Bikanerâ2 February 1943, Bombay), was the ruling Maharaja of the princely state of Bikaner (in present-day Rajasthan, India) from 1888 to 1943. He is widely remembered as a modern reformist visionary, and he was also the only’non-White’ member of the British Imperial War Cabinet during World War I. Sri Ganga Singh was born on October 3, 1880, the third and youngest son of His Highness Maharaja Sri Lal Singh, and brother to Sri Dungar Singh. Succeeding his brother on December 16, 1888, he was initially educated privately, then at Mayo College, Ajmer from 1889 to 1894. From 1895 to 1898, he was put under the guidance of Thakur Saheb Lall Singh Ji “Churu” for administrative training, learning administrative work from that of Patwari to that of Prime Minister. For military training, he was sent to Deoli in 1898 and attached to the 42nd Deoli Regiment, which had the reputation of being one of the finest regiments in India under the command of Lt. During the first World War, he commanded the Bikaner Camel Corps which served in France, Egypt and Palestine. As a ruler, he established a Chief Court in Bikaner, presided over by a Chief Judge who was assisted by two judges. Bikaner was the first State in Rajasthan to take such a step. He announced the establishment of a Representative Assembly in 1913. He later established a High Court with a Chief Justice and two sub-judges by an edict in 1922. Maharaja Ganga Singhji was the first prince in Rajputana to grant full charter of powers to a high court. Also, facilities of a saving bank were made available to the people. He was one of the first rulers to introduce through legislation a Sharda Act by which child marriages were stopped. He had a personal gun salute of 19-guns granted in 1918 and a permanent local gun salute of 19-guns granted in 1921. He was the Hon. ADC to HRH The Prince of Wales in 1902, later serving him when he became His Majesty King George V, the King-Emperor, in 1910. A Member of the Central Recruiting Board-India 1917, he represented India at the Imperial War Conference 1917, the Imperial War Cabinet and the Paris Peace Conference 1919 and was Chancellor of the Indian Chamber of Princes from 1920-26. He also represented India as a delegate at the fifth session of the League of Nations in 1924. As well, the Maharaja served as Patron of Benares Hindu University and Sri Bharat Dharam Mahamandal, as Vice President of East India Association and the Royal Colonial Institute, a Member of the Indian Gymkhana Club and of the Indian Army Temperance Association, the General Council of Mayo and Daly Colleges, the Indian Society of Oriental Art, the Indian Society-London, the Bombay Natural History Society, and was the first Member of the Indian Red Cross Society. Singh was a famous Indian freemason in his time. He married 1stly in July 1897 HH Maharani Vallabhkuver Sahiba of Pratapgarh; she died 19 August 1906. He then married 2ndly HH Maharani Sri Bhatiyaniji Sahiba of Bikamkor and had issue, four sons and two daughters. He died 2 February 1943 in Bombay after a reign of 56 years, aged 62, and was succeeded by his son Sadul Singh. The item “1937, India, Bikanir State, Ganga Singhji. 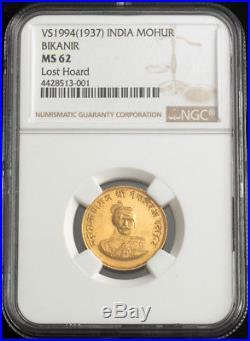 Gold Nazarana Mohur Coin. NGC MS-62″ is in sale since Saturday, November 4, 2017. 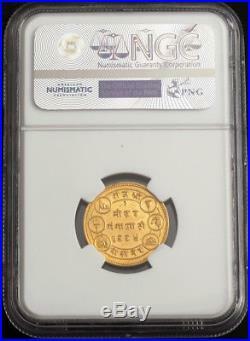 This item is in the category “Coins & Paper Money\Coins\ World\Asia\India\Princely States”. The seller is “coinworldtv” and is located in Europe. This item can be shipped worldwide.